[01:07:18] <toastydeath> nobody will notice if i push them over. [01:07:30] <toastydeath> it'll be the perfect outlet for my rage that I'm there in the first place. [01:07:45] <toastydeath> I'm not actually motor impared, I assume I can dodge. [01:08:07] <toastydeath> against whom i stand no chance. [01:09:27] <SWPLinux> "Set goals for middle-school and high-school students to serve 50 hours a year of public service, and for college students to serve 100 hours a year." [01:10:13] <toastydeath> so if the students don't show, the college/hs doesn't get funding. [01:10:14] <SWPLinux> where did you read that? [01:10:32] <toastydeath> he's commented several times, not just once. [01:13:26] <SWPLinux> which news websites? [01:17:42] <fenn> SWPLinux: did you really work on tanks? [01:26:51] <toastydeath> it would be very nice to be wrong on this issue. [01:27:52] <SWPLinux> see! I was right!!! [01:28:14] <toastydeath> but i've seen it enough from obama supporters that it concerns me. [01:53:58] <toastydeath> i just want to make sure I don't have to be part of it. [01:53:59] <boulabiar> can I find help for Xenomai here ? [01:58:22] <boulabiar> isn't Xenomai more up-to-date ? [01:58:28] <boulabiar> why do you use RTAI ??? [02:01:50] <boulabiar> sorry but what is EMC ? [02:03:18] <boulabiar> Enhanced Machine Controller = "is a machine controller" ??????? [02:07:58] <SWPLinux> I didn't see anything about a requirement, but I do see the phrase "should be expected to do 50 hours ..."
[02:08:20] <SWPLinux> have you read "Starship Troopers"? [02:08:59] <toastydeath> that you are making to it? [02:09:33] <JymmmEMC> SWPLinux: But did they have a fscked up voting system? [02:10:13] <toastydeath> and i think that's terrible. [02:10:37] <toastydeath> yeah, and i think that's not the right way to go. [02:11:16] <JymmmEMC> PARTY AT FENN'S HOUSE! [02:11:29] <SWPLinux> note that volunteering to do IT work or machine repair for some community organization would also be considered "community service"
[02:11:39] <SWPLinux> it doesn't have to be "some politician telling you what to do"
[02:11:54] <toastydeath> the compulsory part is what bothers me. [02:12:51] <toastydeath> and what they think about other people. [02:13:11] <toastydeath> fund the crap out of them. [02:13:20] <toastydeath> but don't make it mandatory, in any way. [02:13:38] <toastydeath> give people the oppertunity to show that they're good people, don't tell them "help your fellow man or else." [02:13:58] <toastydeath> that's the only part i'm worried about. [02:14:07] <toastydeath> if he wants to pump funding into volunteer programs, do it. [03:08:14] <skunkworks> mounted one of the 2540 line encoders on the back of the monster servos. [04:59:47] <ewilhelm> question: "Several letters (I, J, K, L, P, R) may have different meanings ..." -- there is no L though? [05:05:50] <ewilhelm> oh? is that being defined somewhere that I'm missing? [08:57:35] <tomp-road> to get good cad for linux, i used vmware on last laptop. [08:57:45] <tomp-road> ﻿i just got new laptop and installed from hardy-emc live cd. [08:57:53] <tomp-road> ﻿now have ﻿error installing vmware server 2 for linux on ubuntu8.04. [08:58:05] <tomp-road> ﻿﻿﻿ err was gcc4.2.4 was installed but gcc4.2.3 was used to build system. [08:58:07] <tomp-road> ﻿ re-installing gcc 4.2.3-1ubuntu3 still had gcc symlinked to gcc4.2.4. any ideas? ignore warning? [14:59:58] <cradek> what remains wrong with offs? 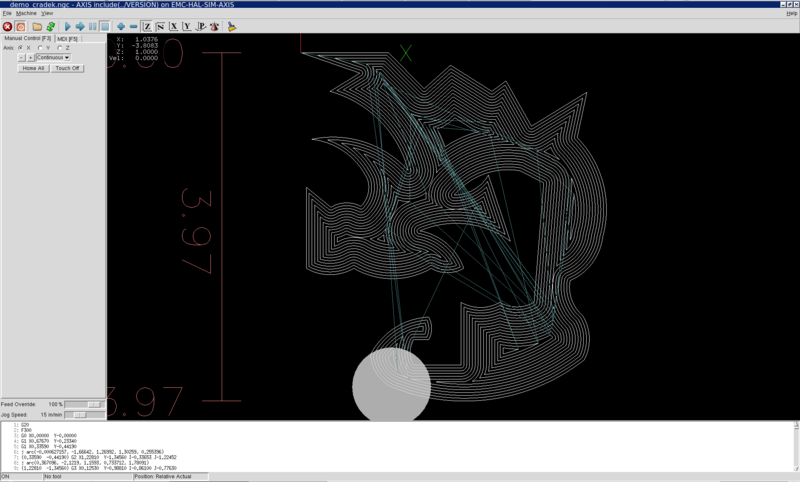 [15:00:16] <jepler> cradek: it does not get all self-intersecting offset paths right, it only gets simple cases right. [15:06:52] <jepler> "For a similar problem, which (I believe) formalizes what makes constructing the straight skeleton hard, see "Crashing Motorcycles Efficiently". " [15:08:12] <SWPLinux> consider a 1" square, but offsetting by 2"
[15:18:38] <cradek> but drills and boring bars, I dunno. [15:52:00] <cradek> oh so the turret goes in front of the work, not beside it? [15:58:06] <BigJohnT> you going to bid on it? [16:00:50] <micges> emc will optimize this gcodes in G64P0.01 mode ? [16:05:54] <jepler> my recollection is that emc will exact-stop at an M3/M4/M5 regardless of the path control mode, but I don't know for certain. [16:09:07] <micges> so there is no way to change IO during move without stopping ? [17:04:24] <jepler> this guy's cam software requires that there be a sound device to run !? 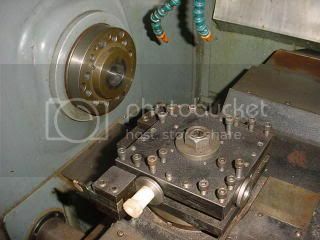 [18:14:11] <plattschnauze> hy everbody, i am planing to tune up my CNC to a fabber, i know someone has done it before but i have some differnet ideas for the extruder. There for i need information wether there is a pin which i can use to differ between G0 or G1/2 movements. does it exist ? [18:14:57] <anonimasu> why not just program a Mxxx to turn off the extruder before you do rapids? [18:18:33] <plattschnauze> I want to use a Stepper for the Extruder in a Kinematic so that i can use ramps and other things. that is what im missing in repraps at this time. [18:26:37] <plattschnauze> by the way, is alex online sometimes ? [18:27:18] <skunkworks_> are you talking some sort of feed rate override? [18:35:09] <fenn> what do you mean "ramps"? [18:38:28] <plattschnauze> yah, i am searching for a pin that differs between G0 and G1 movements. [18:39:59] <skunkworks_> you could probably turn a pin on above a certain velocity..
[18:42:35] <fenn> hmm is there a way to make the spindle slow down in response to feed override? [18:42:44] <fenn> is that just a scale block in hal? [18:47:19] <Fisia> Can any one tell me, How fast is, Stepper Step can run on EMC2 ? [18:48:27] <Fisia> is it 80k step / sec ? [18:51:06] <Fisia> is it 30K is the fastest EMC2 able to? [18:52:11] <plattschnauze_> I want to run the extruder in a exact follow off the XY Axis (example : X moves 3 mm / Extruder has to make 12 steps ) only while G1 / G2 moves and with the same accelerations ! [18:53:01] <Fisia> fenn... explain why please..
[18:53:55] <fenn> plattschnauze_: but the "only while g1" isn't going to happen, sorry. [18:53:58] <Fisia> <plattschnauze_> u can use 2 computer ? [18:54:06] <Fisia> at a time..
[18:56:06] <fenn> sometimes i ssh from one computer to another and back, does that count? [18:56:21] <Fisia> fenn, step/dir is a crappy interface, what does it mean, explain please..
[19:00:30] <anonimasu> step and dir is a nice hack for nice steppers..
[19:00:43] <anonimasu> if you want a better/nicer/faster/more accurate machine use servos..
[19:10:26] <fragalot> fenn: isn't that basically what microstepping is? [19:14:14] <Fisia> btw. other day (at night day) i ask about RTAI that only active when G-Code being execute and CNC really goes running, how about it? [19:17:11] <anonimasu> did you try emc yet? [19:18:06] <Fisia> i know that just now. [19:22:34] <fragalot> Yes, that is why the economy is shot. [19:34:08] <anonimasu> anyone knows anthing about scraping? [19:34:26] <anonimasu> think making scrapers out of a old file would work? [19:37:44] <cradek> sorry to hear about your boss. what is the question? [19:38:33] <anonimasu> got a name of the machine? [19:38:46] <jepler> is the mill controlled by emc2 now? or it's controlled by something else, and you want to make emc the controller? [19:38:57] <anonimasu> then call the reseller. [19:41:58] <anonimasu> do ou know anything about cnc machines or g-code or anything? [19:43:30] <anonimasu> partyzun: do you know anything about cnc machines? [19:44:20] <anonimasu> partyzun: isnt there already software from the manufacturer to operate the machine? [19:47:50] <Fisia> jepler is right, that would do. [19:50:41] <jepler> the first step is to gather much more information about the machine. [19:58:56] <dmess> anon... what mat'l are you scrapping??? [20:17:17] <anonimasu> err damn keyb. [20:36:11] <SWPadnos> well damn. lathes.co.uk says this about the HXL "In 1983 the company launched its first CNC machine, the Model HXL; although originally designed as a CNC toolroom lathe it was marketed as a production machine and, with a weak turret and cantankerous GE1050 control system, was destined not to be a success." [20:38:32] <SWPadnos> dmess, do you know about the Hardinge HXL? [21:21:54] <alex_joni> SWPadnos: it might also be a starting system..
[21:36:34] <skunkworks_> SWPadnos: isn't this something your mom would know? [21:53:51] <SWPadnos> skunkworks_, no, she wouldn't know anything that has to do wit (gasp) engineering! [21:57:06] <markdashabout> but I dont have it. [21:57:15] <markdashabout> Is there? And if not, how can there not be? [21:58:13] <cradek> for the last part of your question: there could not be, since sherline has not given us this information. [21:58:24] <markdashabout> Yes, I heard that, too and that doesnt seem like a problem. [21:58:29] <SWPadnos> it does not make a complete config for your sherline - you still need to know things like pulley ratios, screw pitch, travel limits, etc. [21:59:26] <SWPadnos> "the config screen" ? [22:00:06] <markdashabout> No, I fired up emc2 with the emc command and have a list of (I think) .ini files ona gui. [22:00:39] <markdashabout> There are thousands of these tiny table top mills around I suppose and it seems odd that I should need to configure? [22:01:18] <markdashabout> I am nervous that if I run stepconf it will not be as good as my pre-configured emc1 configuration. [22:01:30] <cradek> markdashabout: I agree, it would be nice if sherline would contribute configurations for the machines they are currently selling; we would be happy to host and distribute them with emc2 releases. [22:02:00] <cradek> if you recently bought a new sherline machine, you are in a position to let them know that it is important to you. [22:02:18] <markdashabout> Would it be possible to parse info out of an emc1 config or is it very very different? [22:03:07] <markdashabout> Yeah, thought it would be, wouldnt be much point in writing emc2 if it was basicically the same now would there !!! [22:03:28] <cradek> but of course, that is up to them. [22:04:09] <markdashabout> It must be said that the EMC1 machine works very well, what really hacks me off is the linux is so old that even getting a network to work is a challenge. [22:05:33] <markdashabout> But I am sure I have seen people say just select it from the menu, I even got the name of the file Sherlinemill.ini, but of course anyone could make that up. [22:05:43] <markdashabout> No , no development. I want emc2 anyway! [22:06:02] <cradek> go ahead and work through the stepconf wizard, and let us know if you have any questions. [22:06:24] <markdashabout> Alright I'll do that, if thats what people do. [22:06:59] <SWPadnos> but it doesn't say they exist, it only says that they're more descriptive names than "generic"
[22:08:39] <markdashabout> There are a lot of these inexpensive mills around after all, and at least some of them must be the same???!! [22:09:34] <markdashabout> Well of course if nobody does then that would explain it. [22:10:19] <cradek> just work through the stepconf wizard. [22:10:59] <cradek> markdashabout: sherline used to be very active in the emc community; recently, they aren't. [22:12:23] <markdashabout> Trouble is, do you think I'll get a workable config out of stepconfig. I mean one that makes circles circular and the right size?? [22:15:45] <markdashabout> Sorry asked same question twice thought client had crashed!!! [22:15:50] <markdashabout> Ok will go and try it! [22:15:57] <markdashabout> Thanks for your help guys! [22:16:14] <markdashabout> Ok will hold ok !! [22:16:16] <cradek> welcome, hope you get it going. [22:20:20] <markdashabout> Oh, wow, well I am honoured to be talking to the king! [22:21:03] <jymm> well, that queen eats lie a pig! [22:25:56] <alex_joni> archivist: should be 8pm there.. ? [23:09:34] <markdashabout> Of course, there are no limit switches!! [23:51:52] <markdashabout> actually are, because the two pre-config options (sherline, xysomething) neither seem to work.